The Relationship Suite (New York) - Book Appointment Online! 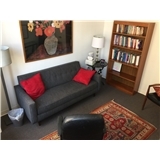 We are a multilingual psychotherapy practice and specialize in Individual and Couples Therapy. We are dedicated to helping people who are interested in evolving and living more fulfilling lives. We are interactive and give guidance and feedback to our clients. We work on a sliding scale and also provide packages for clients. Rachel Moheban is wonderful to work with She is empathic insightful and helps you to reach your goals and find helpful solutions. My appointment started right on time and she carefully listened to my issues and asked me thought provoking questions. I sensed her desire to help me manage my issues.